After Noah built the ark, God caused at least two of each kind of animal to go into the ark. 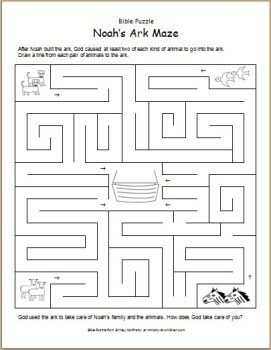 In this maze children draw lines leading the animals to the ark. Click here to download the printable PDF worksheet. If you’re teaching a unit on Noah and the Ark, our website has many free resources that can help. Don’t miss this video story or Mandy’s coloring page about Noah’s Ark.